Following the tradition of successful conferences held in North & South Americas and with the magnificent success and overwhelming response of our previous International Conference on Positive Psychology & Cognitive Behavioral Therapy, June 13-14, 2016 Philadelphia, Pennsylvania, USA; 17th World Summit on Positive Psychology, Psychotherapy & Cognitive Behavioral Sciences May 01-03, 2017 Toronto, Ontario, Canada and 29th World Summit on Positive Psychology, Mindfulness & Psychotherapy, May 28-29, 2018 New York, USA we are privileged to announce the 30th World Summit on Positive Psychology, Mindfulness and Psychotherapy in March 18-19, 2019 scheduled at Chicago, Illinois, USA. ConferenceSeries.com organizing Psychology Conferences in 2019 in USA. We organize Psychology, Mental Health, Psychiatry, Psychotherapy, Addiction, Nursing, Neurology, Neuroscience and Philosophy Meetings in the fields related to it like Happiness, Mindfulness, Wellbeing, Stress, Depression, Anxiety, Humanistic, Wellness, Autism, Buddhism, Meditation, Yoga, Spirituality, Religion, Quality of Life, Insight oriented and Cognitive Behavioral. Positive Psychology 2019, Happiness Event is a unique meeting that unites academics, scholars, practitioners and business professionals at an international, intercultural and interdisciplinary environment in the rapidly emerging globalised world. Positive Psychology 2019, Happiness Event is a special designed cluster of 2 day event which will be organized around the theme "Psychological and Philosophical pursuit of Happiness and Wellbeing". With, 2 days of the perfect blend of high quality presentations, intense scientific topics, panel discussions, workshops, keynotes, special sessions, speaker oral & plenary sessions, student poster presentations, round table discussions and exhibition from the world's brightest minds in social science and humanities departments, education, business and the arts with an expectation of a huge gathering from across the world, the summit delivers the real-world experiences and best practices needed to optimize happiness and well-being for the quality of happier life. To promote rigorous scientific approach in pursuit of Happiness through Positive psychology and Mindfulness for Subjective Well-being. Improving Global education by making greater use of intrinsic motivation, positive affect, and creativity by Yoga & Meditation. The meeting will provide a valuable opportunity to network, share knowledge and ideas, and consider collaborative projects. Psychology and Philosophy under Arts, Humanities and Social Sciences attracting the attention of academic and education experts - as well as world-class international authorities - on the application of happiness, positive education, mindfulness, wellness and wellbeing science in different educational, organizational and human life contexts. It also encourages the active participation of Young Student Researchers to grab a Poster Award Competition and Young research Forum at the conference venue. The most recent techniques, developments, and the newest updates in psychology, psychotherapy and philosophy is the hallmark of this conference. The event aims to provide a discussion platform involving University professors, students, faculty staff, academic researchers, hospitalists, international speakers, scientists, research scholars, practitioners, psychologists, psychotherapists, psychiatrists, mental health professionals, counselors, coaches, neurologists, neurosurgeons, nurse practitioners, social workers, pharmacists, clinicians, physicians, clinical practitioners, occupational & speech therapists and Medical healthcare givers, rehabilitation specialists, business entrepreneurs, healthcare professionals, educational leaders, policy makers, industry representatives, pharma industries/companies, start-ups and innovators and investigators to meet, network with different medical and scientific interventions interested in and working on well-being promotion and enhancing quality of life. Bring your family and work group to this inspiring event. You will have the opportunity to turn inspiration into action by participating, listening, learning, liking, sharing and repeat! Happiness event will have a space for companies, hospitals, organizations, medical centers, yoga and meditation centers, and/or institutions to present their services, products, innovations and research results. If your company/organization is interested in participating in this event, contact us here. Being held in the prime destination, city of Chicago has become one of the world's most in-demand and accessible places for local and global meetings and conventions. Known as a "city of neighborhoods", Chicago has 77 diverse communities bursting with their own distinctive vibe, culture, attractions, and cuisine. International visitors appreciate the city's distinct art, history, and languages. When you visit Chicago, no matter where you are from or where you go, you'll feel at home. Chicago is the third most populous city in the United States, after New York City and Los Angeles. With over 2.7 million residents, it is also the most populous city in both the state of Illinois and the Midwestern United States. Positioned along Lake Michigan, the city is an international hub for finance, commerce, industry, technology, telecommunications, and transportation. Chicago was the second most visited city in the United States with 55 million domestic and international visitors behind the estimated 62.8 million tourists to New York City in 2017. In 2014, Chicago attracted 50.17 million domestic leisure travelers, 11.09 million domestic business travelers and 1.308 million overseas visitors. These visitors contributed more than US$13.7 billion to Chicago's economy. There are many colleges and universities in the Chicago area, of which the University of Chicago, Northwestern University, and the University of Illinois at Chicago are classified as "highest research " doctoral universities. Chicago Public Schools (CPS) is the governing body of the school district that contains over 600 public elementary and high schools citywide, including several selective-admission magnet schools. Since the 1850s, Chicago has been a world center of higher education and research with several universities that are in the city proper or in the immediate environs. These institutions consistently rank among the top "National Universities" in the United States, as determined by U.S. News & World Report. Chicago also has a high concentration of post-baccalaureate institutions, graduate schools, seminaries, and theological schools. The city lies within the humid continental climate zone and experiences four distinct seasons. Summers are warm to hot and often humid, with a July daily average of 75.8 °F (24.3 °C). Winters are cold and snowy, although the city typically sees less snow and rain in winter than that experienced on the East Coast. There may be quite a few sunny days through winter. Spring and autumn are mild seasons with low humidity. Manufacturing, printing, publishing and food processing also play major roles in the city's economy. Several medical products and services companies are headquartered in the Chicago area. Chicago is a major world convention destination. The city's main convention center is McCormick Place. With its four interconnected buildings, it is the largest convention center in the nation and third-largest in the world. Chicago also ranks third in the U.S. (behind Las Vegas and Orlando) in number of conventions hosted annually. Chicago is served by O'Hare International Airport, the world's second-busiest airport measured by airline operations on the far Northwest Side, and Midway International Airport on the Southwest Side. Landmarks in the city include Millennium Park, Navy Pier, the Magnificent Mile, the Art Institute of Chicago, Museum Campus, Chicago History Museum, the Willis (Sears) Tower Skydeck, the Museum of Science and Industry, Museum of Contemporary Art, Shedd Aquarium, Adler Planetarium, 360 CHICAGO, The Field Museum, Chicago Riverwalk, Buckingham Fountain, Wrigley Field, Chicago Theatre, Tribune Tower and Lincoln Park Zoo. Positive Psychology 2019; Happiness event invites participants from all leading Universities, Colleges, clinical research institutions, Hospitals, Medical Centers, Clinics and private Organizations, Pharmaceutical companies to share their experiences on all aspects of this rapidly expanding streams. In this day and age, society is confronting amazingly extreme difficulties as a global warming, natural disasters, economic recession, unprecedented homelessness, terrorism and the depleting continuation of war. With this trouble and repulsiveness, where on the planet does a science in view of testing happiness, wellbeing, self-awareness and 'the great life' fit into the cutting edge motivation? The extent of psychology is regularly becoming due to continually looks into in this field. Positive psychology is one of the most up to date branches of psychology to rise. Throughout the previous 20 years, enthusiasm for positive psychology has been drastically expanding in business enterprise, public administration, education and individual life. Organizations that need to be effective and people who need to have a brilliant life that they appreciate are ending up progressively mindful of the significance of constructive brain research. It is the investigation of the qualities and ethics that empower people, networks and associations to flourish. 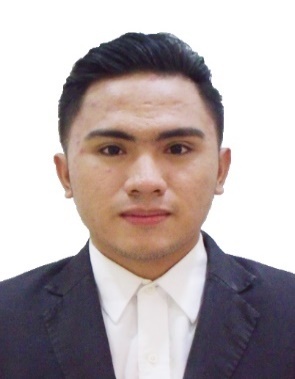 Positive Psychology helps in the counteractive action of mental illness by perceiving and supporting an arrangement of qualities, capabilities and ethics in individuals. Chicago is a standout amongst the most associated urban areas, both nationally and globally, making it a prime destination for meeting events and conventions. Chicago as one of the best travel destinations in America. Known as a "city of neighborhoods", Chicago has 77 different networks overflowing with their own distinctive vibe, culture, attractions, and cuisine. International visitors welcome the city's distinct art, history, and languages. When you visit Chicago, regardless of where you are from or where you go, you'll feel at home. There a large number of institutes and associations in USA dealing with the researches on Psychology, Mindfulness, Psychotherapy, Psychiatry, Stress, Schizophrenia, Neurological disorders and Mental Health with psychological disorder patients. Moreover, there have been many public and patient psychology knowledge translation programmes organised in USA, to improve self-efficacy in the prevention & management of psychological & mental disorders in pursuit of Happiness and Well-being. These developments and their corresponding consequences have accompanied USA in becoming a recognized world leader in Positive psychology & Psychotherapy. 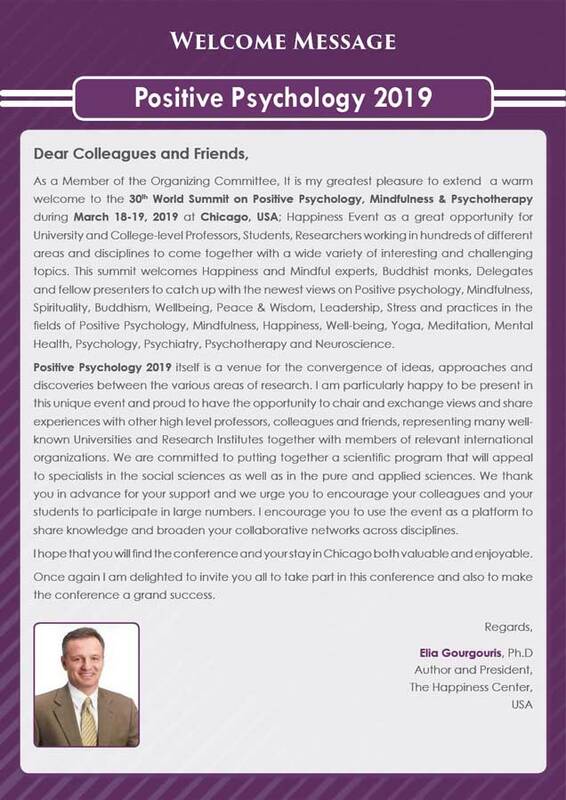 Thus, Chicago has been chosen to conduct the conference Positive Psychology-2019, Happiness Event. Therapeutic/Health: Home to in excess of 30 national medical and health association headquarters, Chicago is at the core of the wellbeing administrations division. What's more, we have faith in keeping that heart solid. In this town, there's dependably a doctor in the house. More than 28,400 of them, also more than 47,000 attendants. What's more, with more than 650 clinics, including a portion of the best hospitals in the nation, Chicago is a prime area for medical industry events. Education: Home to 92 Nobel Prize winners and 583,000 students at 234 universities. Chicago has 2 of the best 20 universities in the US and additionally 100 educational institutions in the main 10%. Other than being positioned in the best 10% of states for amount of colleges and universities. With more than 4,000 open and private K-12 schools, Chicago is the keen decision for scholarly traditions. Everybody's Work Matters Here: Chicago's 4-million-in number private- sector workforce, concentrated on different verticals, makes it a city that puts a dynamic and flourishing business network inside strides of your gathering. With 77 differing ethnic networks, 79 foreign consulates, and more than 100 hotels with multilingual staff to help international travellers, Chicago invites individuals from everywhere throughout the world with a heart that is as large as our city. Enhancing efficiency is a noteworthy worry in American industry. The fundamental instruments of marketing communications incorporate publicizing, advertising; coordinate advertising, sales promotion and individual offering. Abraham Maslow was one of a few prominent psychologists who epitomized the humanistic development and what it remained for. Maslow was an exceptionally renowned clinician crosswise over numerous orders and really begat the term 'Positive Psychology' (Maslow, 1954: 201). At long last, an indication of the quality of the development lies in the way that positive psychology gloats its own scholastic, peer-surveyed diary, Journal of Positive Psychology, established in 2006. Positive psychology started as another area of psychology in 1998 when Martin Seligman picked it as the subject for his term as leader of the American Psychological Association. Mihaly Csikszentmihalyi and Christopher Peterson are viewed as co-initiators of this advancement. This specific zone of psychology centers on how to enable people to thrive and lead solid and happy lives. While numerous different branches of brain science tend to focus around brokenness and irregular conduct, constructive brain research is focused on helping individuals become happier. Positive Psychology has three focal concerns: positive experiences, positive individual traits, and positive institutions. So as to comprehend the field of positive psychology, it is basic to begin by adapting more about its history, real speculations and applications. • 40% of what we do to be happy. It is in that 40% where positive psychology intercedes. Money doesn't necessarily buy well-being, but spending money on other people can make individuals happier. While happiness is influenced by genetics, people can learn to be happier by developing optimism, gratitude, and altruism. Positive psychology can have a scope of genuine applications in zones education, therapy, self-help, stress management, and workplace issues. Utilizing techniques from positive psychology, teachers, coaches, therapists, and managers can motivate others and help people comprehend and build up their personal strengths. There are currently hundreds of undergraduate classes in positive psychology over the world and additionally two Masters programs in applied positive psychology, the main established in 2005 at the University of Pennsylvania, and the second established in 2007 at the University of East London, UK, Italy, Portugal and Mexico are presently making Masters courses in positive psychology in their own particular languages. Positive psychologists would contend that psychology ought to likewise extend its concentration to enhance child education by making more noteworthy utilization of intrinsic motivation, positive effect and inventiveness; enhance psychotherapy by creating approaches that underscore expectation, meaning and self-healing; enhance family life by better understanding the progression of affection, parenthood and duty. Advances in biotechnology and information technology are ready to change well-being research. The advances that we anticipate will have the most effect on both estimation and intervention in the field of positive psychology throughout the following decade. These advancements include: psychopharmacology, non-invasive brain stimulation, virtual reality environments, and big-data methods for large-scale multivariate analysis. Some especially significant potential expenses and advantages to individual and aggregate wellbeing are considered for every innovation and in addition moral contemplations. As these advances may significantly upgrade the limit of psychologists to mediate on and measure wellbeing. As far as present well-being interventions, once in a while called "positive interventions” most comprise of psychosocial exercises like cognitive behavioral therapy, a large number of these interventions assume that an adjustment in consideration, commitment, and convictions can encourage both an adjustment in conduct and enthusiastic experience. As far as mediations, non-invasive brain stimulation, psychopharmacology, and virtual reality are enhancing quickly and multiplying in research and purchaser settings, taking into account the tweak of mental states in courses significant to wellbeing. Cell phones, wearable gadgets, virtual/increased reality, social media and the web give an abundance of valuable devices and assets to help psychological interventions that encourage positive emotions, resilience, personal growth, creativity, and social connectedness. At the methodological and connected level, Positive Technology is worried about the outline, advancement, and approval of computerized encounters that advance positive change through pleasure, flow, meaning, competence, and positive relationships. Incorporating Technology in Positive Psychology Practice investigates the different parts that innovation can play in the improvement of psychological interventions aimed for helping individuals flourish. Investigating the manners by which ICT can be used to cultivate positive emotions, advance commitment in enabling exercises, and bolster connectedness between people, gatherings, and networks, this opportune production is intended for use by psychologists, IT designers, scientists, and graduate students. Positive psychology can help different disciplines, for example, cognitive science, neuroscience, and machine learning characterize the skylines for explore that could yield the most imperative discoveries for human happiness. Positive psychology can survey the effect and ramifications of brain machine interface and neuroscience studies. Consistently, around 42.5 million American adults (or 18.2 percent of the aggregate grown-up populace in the United States) experiences some mental illness, persisting conditions, for example, depression, bipolar disorder or schizophrenia. Additionally, in any year, 1 out of 10 adults and children experience mental health challenges sufficiently genuine to influence working in work, family and school life. Americans experience the ill effects of a wide range of psychological issues and the confirmation shows that they're not going anyplace notwithstanding an expanding number of treatment choices. There are the mood disorders like depression, bipolar disorder, and the less severe dysthymia (low grade depression); anxiety disorders like generalized anxiety disorder, social phobia, agoraphobia, and obsessive-compulsive disorder (OCD); substance abuse; and impulse control disorder (like attention deficit/hyperactivity disorder). President Donald Trump's guarantee of 4% GDP development in America isn’t the most ideal approach to make his constituents more Happier. At last, the Happiness Index is an average of the percentages who reacted with solid concurrence with positive explanations (about great relationships with friends and family, general health and spirituality, plus that general happiness question) and solid conflict with negative proclamations (about money worries, feeling left out by politics, work frustration and lack of pastimes). That is the reason, regardless of whether 38% of individuals unequivocally concur with the possibility that they're generally happy with their lives, the last number is lower. It thinks about components like the outcome that exclusive 27% of individuals said they firmly differ that work is baffling.